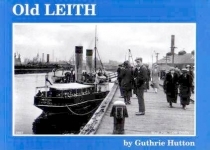 Old Leith takes the reader on a magnificent stroll via Easter Road, Duke Street, Great Junction Street, Restalrig Road, Albany Street, Ferry Road, George Street, Kirkgate, Commercial Street and Newhaven Road. The Bay Horse pub is featured as is the Brig o' Leith and the so-called house of Mary of Guise. Local businesses featured include W. Graham-Yooll oil merchants etcetera and Beruldsen's outfitters. The story of the docks and their development is told including mention of the Sirius, the most famous ship built at Leith. Land-locked methods of transport such as Leith's electric and horse-drawn trams are also covered. Other interesting photographs include the wreck of the Leith Flower Show in 1905 and Trinity Chain Pier. Newhaven fishing village appears with photographs of fishwives, Newhaven Silver Band and Starbank Park.